Hidden in the amazing green valleys of Munnar, Top Station is one of the well-frequented tourist hotspots in Kerala. Located at a distance of approximately 40 Kilometers from Munnar, it is at an average elevation of 1800 meters above sea levels in the Western Ghats. This place is among many attractive destinations in Munnar, that draws a large number of tourists every day, to explore the unseen beauty of the town and to feel its exquisiteness in absolute peace. Here, tourists can experience breathtaking views of the mountains and walk among the clouds for an out-worldly experience. The drive to the top station is pretty long but the drive has beautiful views, tea gardens and two dams on the way. Top station is home to extensive tea plantations that flourish in the cool and soothing clime. The rare Neelakurinji (Strobilanthus) — the flower that blooms only once in 12 years, grows in this region, and features as one of the key attractions of the hill resorts. When the Neelakurinji flower blooms, the valleys, and meadows of the Top station are all painted in various hues of blue, presenting viewers with an incredibly beautiful sight. Other things that make this a place worth visiting are its amazing tea plantation, serene valleys, enchanting waterfalls, and exotic forest life. On the way to Top Station, nature offers so many other cool views to guests. We can see some wildlife animals also on these routes. Top Station got its name from the fact that it was the uppermost railway station, located in the Kundala Valley. At this highest point, you may feel that the clouds are just a hand touch away from you. Top Station is notable as the historic transshipment location for Kannan Devan tea. Tea chests arriving at Top Station Munnar from the Kundalai Valley were transported by a ropeway from Top Station 5 km downhill to the south to Kottagudi, Tamil Nadu. The tea was then shipped 15 km by cart to Bodinayakkanur, then by rail to other places in India and finally shipped to England. Remains of the ropeway station at Top Station are still visible. Trek to Top Station Munnar in Kurangani Hills enables you to enter the trekking routes by walking down the dense woods and plain grasslands of the hills. It welcomes each trekker into their thick jungles, unexplored by the loops of the conventional traveling circuit. 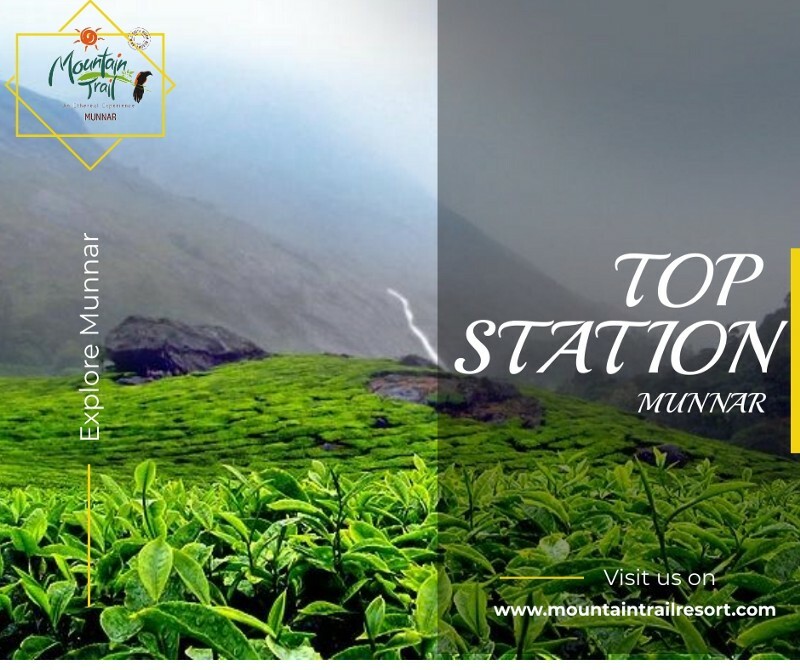 The best time to visit the Top Station is from April to May and the best way to come here is through a bus or cab, which can be booked directly from Munnar. One of the best places to visit in Munnar is the Top station, which offers the magical experience of nature. Unveil the magic of Top station and enjoy an exotic holiday at this lush hill station.